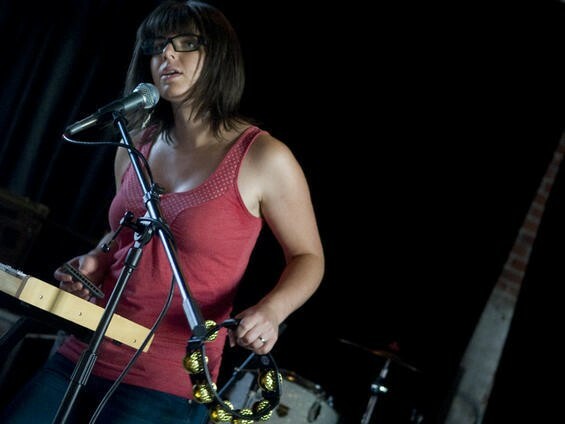 Hear New Beth Bombara Tunes, Help Her Fund a New Vinyl Album! Beth Bombara at the 2010 RFT Music Awards Presentation Celebration. Singer-songwriter Beth Bombara is nearly done recording her first full-length album in the home studio she shares with her husband/fellow local musician, Kit Hamon. "There's pros and cons recording in your own home studio," she says. "For one, you don't have to pay anyone. This is good if you know how to use the equipment well. Kit and I both walked out of college with some decent studio recording knowledge that has allowed us to grow our experience even more since then. It's nice because I feel like we make a good team in the studio, and musically in general. Sometimes we have very different ideas, but that's what makes a recording interesting. "On the flip side, it can be harder to get a project done because, well, you're in your house," she continues. "There's distractions. Dirty dishes, neighbors with loud dogs, street fights. And it's hard because you're not going into a studio for a specific time, with a set deadline. In that sense, it's taking longer than I'd hoped. But the end goal is to make a good record, and I feel confident that will happen." Bombara says she's down to writing the last song for the album, which she's releasing in conjunction with an Off Broadway show on November 19. Stylistically, the music is a departure from her work with the Robotic Foundation, the band of musicians with which she played shows and recorded an EP. "I started playing a lot of solo shows when the band as a whole became too busy to play out," Bombara says. "And when I was playing by myself, the new songs I started writing were more in the alt folk/blues genre. That's this record. I like to say Jenny Lewis meets Muddy Waters." "I feel strongly about music as a tangible artistic experience," she says, "and it seems that idea is becoming overshadowed in this digital age." To help fund the endeavor, Bombara launched a Kickstarter campaign. Fans can pledge money to help her cover recording/manufacturing/artwork expenses - and in return, they can receive everything from copies of the album and a limited-edition T-shirt to a private concert and a home-cooked meal. Anyone who pledges $10 or more will receive a digital copy of the album two weeks before Bombara's Off Broadway show. Bombara's Kickstarter campaign is found right here. An introduction to what she's trying to do is right here.